In our control room, teams of emergency medical dispatchers answer 999 calls and send our staff and vehicles out across London to treat patients. Answering these calls is not always a matter of life or death—but as an emergency medical dispatcher the way you listen and interpret each call will make a vital difference to the response our patients receive. When you receive a 999 call, you are responsible for recording the right information, often under difficult circumstances, before alerting and informing frontline staff. 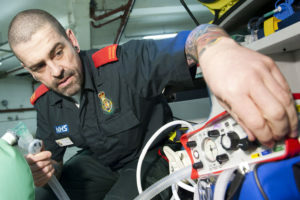 You enter details on to a computer system which categorises the seriousness of the illness or injury, to ensure that the most critical patients receive the fastest response. There are two elements to the work of our control room—talking to patients on the phone and coordinating ambulance staff and vehicles. You are trained to do both. What training do I get? We provide extensive training to ensure that you have the skills, knowledge and confidence to be able to handle 999 calls. Training is modular and you will not move on to the next stage until you have passed written, practical and workplace assessments. The first three months of training are intensive, with a mixture of classroom theory, practical application of that theory, and observation shifts in the control room. You will be given one-to-one supervision before you begin handling calls on your own. Your first four weeks will be spent training to handle calls and follow our internationally recognised questioning protocol. Once you have passed the assessments, you will spend two weeks in our control room answering calls under supervision. After a number of supervised shifts you will be assessed on whether you are able to handle calls on your own. You will then spend four weeks putting your new skills into practice. At the end of this period you will go back to the classroom to begin learning how to dispatch ambulance staff and vehicles. This training consists of a week of exercises followed by a week working in the control room sending out resources whilst being supervised. When you display competence at this stage you will begin working on your own, marking the end of your initial three-month training programme. After your first year you will be assessed and, if successful, you will then be re-graded to the next level of emergency medical dispatcher. 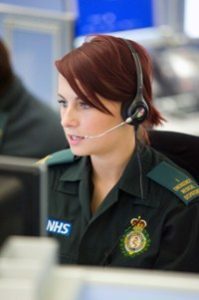 Further career development opportunities exist for you to enhance your skills and move up through the four grades of dispatchers before potentially taking on responsibility for a team of dispatchers covering an area of Greater London. For all our staff, there is the job satisfaction of knowing that what you do makes a difference, but we offer a range of other benefits as well. Find out what they are. We advertise all vacancies via the NHS Jobs website, where you can register for an email alert as soon as a position is advertised. We are always interested in hearing from qualified paramedics. We will also advertise them on the current vacancies section of our website. 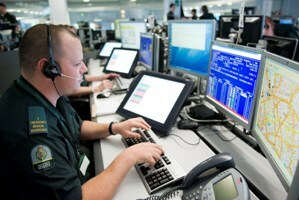 For more information about joining our Control Room, please contact our recruitment team.